This second day would see the fearsome four become the famous five with Simon, our own personal tour guide, joining us in the afternoon. It's not often the Clarets get to play a game just a few minutes walk from his home and so he made the most of the day, joining us around lunchtime. The morning was, quite frankly, slow paced, a stroll round the centre and John entertaining us with his street singing along with a James Bond quiz. It went from Dame Shirley's Goldfinger to From Russia with Love by Matt Munro, via Sheena Easton, Tina Turner and Lulu who didn't shout, and all delivered with the precision of Steve Jones. Simon recommended the open top bus tour in the afternoon - and what a good shout that was. It lasted not far short of two hours and took us to just about every place of interest. 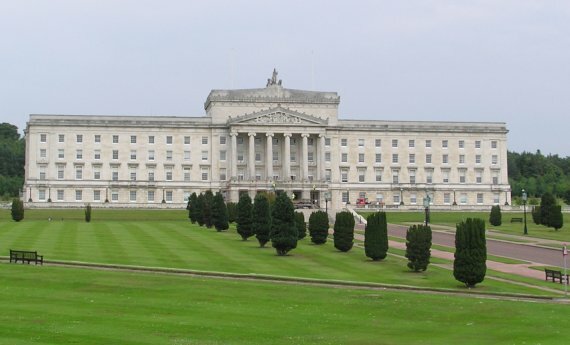 It starts and ends in the city centre and takes you out past the Titanic Quarter and Belfast George Best City Airport and to Stormont before heading back to the areas of such recent history in Belfast - to Falls Road, Shankill Road and Crumlin Road and the prison. You see the murals, both political and football. I had the best seat on the bus next to Simon, getting a lot more detail from him. He even pointed out such highlights as Dundela FC which is just a few minutes walk from the Oval, and where he watches his football. John didn't quite catch all of the tour, it can be difficult when you fall asleep for part of it. No doubt though that overall we learned a lot about Belfast and there was just time for John to get musical again before we headed out to Glentoran. After a short stop at the Welders club, and a wonderful pint of Guinness, we got to the ground. There was no segregation, we all went through the same turnstiles and we all chatted together. 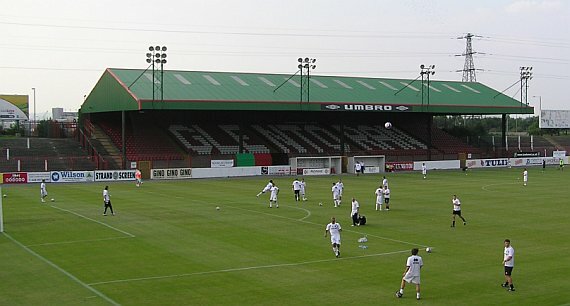 It was how football should be and these Glens fans wanted to talk about those links between the two clubs, and I'm sure the name Glen Little came up more than any other. For their older fans there was only one name for them. 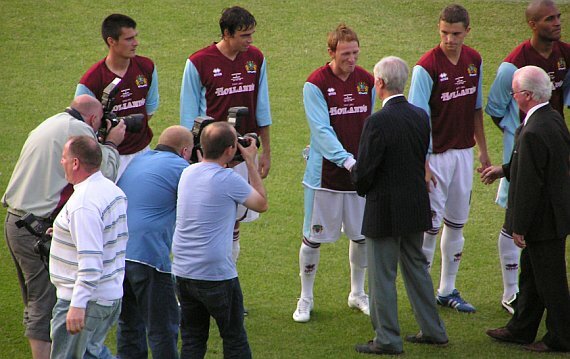 We think of Jimmy McIlroy as our own but believe you me he remains as popular there as he does in Burnley. It is where he started his career and of course he played for their country on over fifty occasions. I spoke to two older Glens fans about him and told them that he had come over for the game. "Jimmy McIlroy is in the ground?" one of them asked in disbelief. When I told them he was I saw the tears streaming down the cheeks of the other, their hero had come home. I took my seat for the game and Jimmy, alongside Billy Bingham, came out to be introduced to the two teams. What a welcome these two greats of Irish football received from both sets of fans inside the ground. For the players too it looked a special moment. We won the game 5-0, for once I wasn't on match reporting duties, and after the game we were guests of the club courtesy of their chairman Aubrey Ralph. It gave us the opportunity in particular to talk to those special guests. It is certainly the first time I've ever spoken to Bingham but they are so interesting to talk to. Barry Kilby came over, but I didn't think it was right to ask him any pointed questions, so I just said: "Is Eagles signing?" I won't tell you exactly what Barry said but he did admit that he usually finds out such things from Clarets Mad. It was all a great end to two great days in Belfast. My first ever visit and one I would recommend to anyone. Everywhere we went people went out of their way to be helpful and friendly, they made you feel so welcome. So thanks Belfast, and thanks Glentoran for making our trip so enjoyable. Also thanks to Simon for the extra information, for the match report and most importantly for his company on that second day. Finally a big thanks to Ade Akinbiyi - but that's another story.